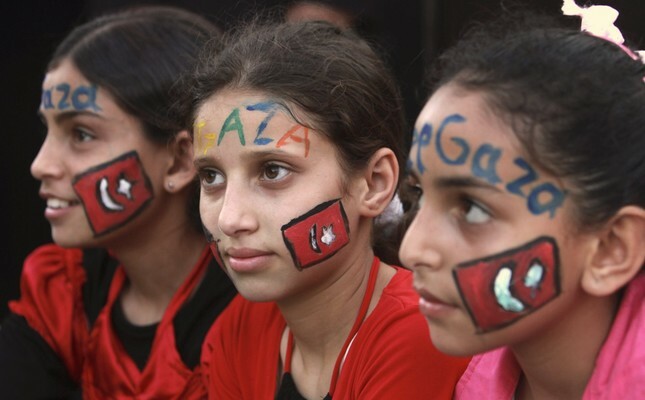 Palestinian children, with the Turkish flags painted their face, attending a protest against the Israeli naval commando raid on a flotilla attempting to break the blockade on Gaza, in Gaza City, June 2, 2010. To understand the world history we must understand the history of Islam, and to understand the history of Islam we must understand the Arab-Turkish relationship. The Arab-Turkish relationship is ancient, deeply rooted in religion and culture, intertwined and interdependent. But above all, the Arab-Turkish relationship is very complex. It's more or less like a marriage; ironically, it's not like an Islamic marriage where divorce is permitted, but rather, is like a faithful Catholic marriage where divorce is not an option. The realities of geography, history, and religion render the separation of these two nations impossible. And like all marriages, the Arab-Turkish relationship has its ups and downs, and needs hard work to manage and make sure it is successful. For this reason, it is vital that each partner knows how the other half feels. After the foundation of the Turkish Republic, Turkish-Arab relations for the most part were distant and cold and at times even antagonistic. However, the arrival of the Justice and Development Party (AK Party) changed that. Turkey's foreign policy underwent major changes becoming more independent and putting an end to a tradition of shunning the Arab World. Instead of a foreign policy characterized by subordination to the West and "intentional neglect" of many of the historical spheres of influence of the Ottoman Empire, a policy of "active engagement" was initiated. This changed the tide of how Arabs view Turkey. Positive Arab opinion of Turkey reached its climax in 2011. At that time, Turkey was perceived by the Arab people as an "ideal model" for change. A model characterized by economic, cultural, and political success, a model capable of reconciling Islam with democracy. In short, it was a model the Arab people wanted to imitate. Then the Arab Spring came, tragic events unfolded, Turkey had a few missteps and its image in the eye of the Arab public took a hit. With the rise and fall of the Arab people's opinion of Turkey, Turkey's soft power rises and falls accordingly. Consequently it is crucial for Turkey to continuously and accurately gauge the Arab people's opinion of its policies. In this regard the 2016 Arab Opinion Survey is of high relevance. The results of the highly anticipated survey were released on March 13. This survey is the fifth in a series of yearly public opinion surveys across the Arab world and based on the findings from face-to-face interviews conducted with respondents in 12 separate Arab countries: Saudi Arabia, Kuwait, Iraq, Jordan, Palestine, Lebanon, Egypt, Sudan, Tunisia, Algeria, Morocco and Mauritania. With an aggregate sample size of 18,311 respondents, the Arab Opinion survey is the largest public opinion survey in the Arab world. A section of the survey is devoted to Arab public attitudes toward the foreign policies of regional and global powers. The regional and global powers listed in the survey include the U.S., Russia, Iran, France, China, and Turkey. Arab public opinion of the foreign policies of regional and global powers toward the Arab region is broadly negative. Around 75 percent of respondents held negative views of U.S. foreign policy toward the Arab countries; 71 percent had negative views of Iran's Arab policies; and 66 percent expressed negative views of Russia's policy toward the Arab world. Among the countries surveyed, Turkey is the only country that is perceived positively by the majority of Arab people. Only 34 percent held negative views of Turkey's foreign policy toward the Arab World. However, the picture is not all rosy for Turkey. During 2016, Arab public attitudes toward Turkish foreign policies recorded their most negative levels on record. The Palestinian cause, the civil war in Syria, and the instability in Iraq are the three most important political issues followed by the Arab masses. When asked to look at the foreign policies of regional and global powers in these three areas, the results were very critical. The vast majority of Arabs had negative views of U.S. policy toward Palestine (79 percent), Syria (77 percent) and Iraq (78 percent). When asked to look at specific Russian foreign policy areas, nearly two-thirds of Arabs have negative views of Russian policy toward Palestine, Syria, and Iraq. When it comes to the Iranian foreign policy areas, nearly two-thirds of Arabs have negative views of Iranian policy toward Palestine, Syria, and Iraq. In contrast, the Arab public is roughly equally split in its perceptions of Turkish foreign policy in Syria and Iraq: roughly 43 percent view Turkey's Syria positively, compared to another 43 percent who view it negatively; in Iraq, the comparable figures are 38 percent (positive views) and 45 percent (negative views). Meanwhile, 49 percent of the Arab public had positive views of Turkey's policies toward Palestine, compared to 35 percent who had negative views. Together with the United States, Israel was identified by respondents as one of the two countries that posed the greatest threat to collective Arab security; 89 percent of respondents believe that Israel is a threat to the stability of the Arab region while the percentage is 82 percent in the case of the U.S. Both Israel and the U.S. are closely followed by Iran. Some 73 percent of respondents considered Iran a treat to the stability of the Arab region. On the opposite scale, we find Turkey and China, the only two countries in the survey that were not viewed as a threat by the majority of Arab people. Only 38 percent (in the case of Turkey) and 39 percent (in the case of China) of respondents viewed these two countries as a threat. Turkey's image in the Arab World is far from its heyday prior to the Arab Spring, yet it is still positive when compared to other global and regional powers. Turkey's support for the just Palestinian cause is a source of admiration for the Arab people toward Turkey. Turkey's support for the Palestinian cause is an area where Ankara should not relent. It is both the ethical and the politically wise thing to. The moral and humanitarian dimension in Turkey's foreign policy is also another area where Turkey scores a lot of points with the Arab public. Finally, the policy of Prime Minster Binali Yıldırım to increase the number of Turkey's friends and reduce its enemies is sure to improve the standing of Turkey in the Arab world.